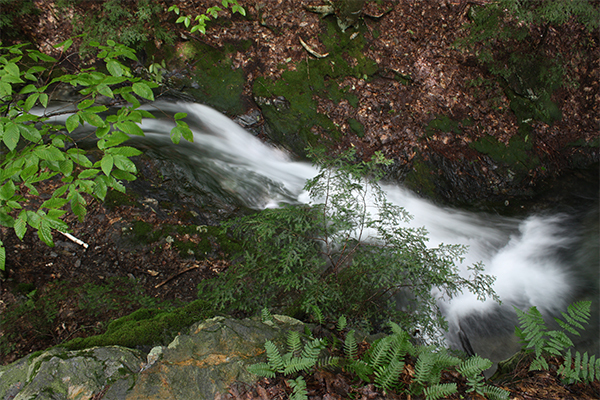 The majority of visitors to Daniel's Brook Chasm seem to arrive by ATV, making this waterfall one of the very few accessible by such mode of transportation in New England. Pittsfield State Forest is actually one of the best spots in the state for this type of activity with a comprehensive network of wide and relatively smooth trails. Hikers and mountain bikers are welcome on the trails and at the waterfall as well. The falls start off as a 12-foot long narrow slide dropping three vertical feet. 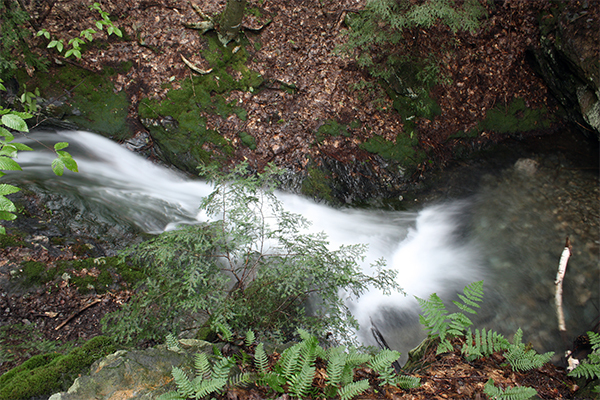 After the slide, the brook passes through the chasm, dropping a total of 20-feet consisting of two major horsetails and some intermediate cascades. The walls of the chasm are so narrow the falls rumble loudly. It is difficult to obtain a quality photograph due to the characteristics of the chasm. The water is clear, but the stream is somewhat seasonal, so I am unsure how attractive the falls would be in the dog-days of summer. While you are in the general area, don't miss a quick trip to Balanced Rock State Park. This is one of Massachusetts' most impressive balanced rocks (some would say its the most impressive). There's a ton of spray-paint all over it, but it's fascinating to ponder how this rock still stands on its own. You can find the entrance to this park on nearby Balance Rock Rd (you'll need to drive to a separate trailhead). The hike to Daniel's Chasm isn't all that enjoyable because you will be walking along trails that have been cut up by ORVs. The overall footbed isn't very smooth and mud is common. Starting on May 1st of each year, you also need to watch out for speeding ORV-ers as this trail network is much more commonly used by trail machines than by hikers. From the parking area, take the wide dirt road to the left of the parking area. The river is out of sight from the start of the trail. Start hiking the dirt road as it gradually increases in elevation. After hiking for 0.2 mile, you will reach a fork. Take the right fork, descend briefly, and then climb moderately steep terrain for 0.3 mile further upstream to the chasm. Ignore any minor trail junctions (including a T-junction at 0.4 mile from the car; stay straight here) and you will reach the chasm about 0.5 mile from the parking area. The chasm is clearly visible from the trail. Throughout this hike, you will be hiking mostly parallel to the brook, but it will be up to 150 feet away from you and often out of sight. You cannot see the main falls and the most substantial part of the chasm from the trail. You must bushwhack 50 feet downstream on moderate terrain to view this. Unfortunately, there are often several downed trees lying across the chasm that reduce the overall appeal of this place. You should also walk over to the top of the falls, where you will find a pretty slide. This is perhaps the best opportunity for photography here. From the junction of US-7 and MA 9 in downtown Pittsfield, take US-7 north for 2.5 miles and take a left onto Hancock Rd. Follow Hancock Rd for 1.9 miles and take a right onto Churchill St. Follow Churchill St. for 1.0 mile and take a left onto Potter Mountain Rd (no street sign in 2017). Follow Potter Mountain Rd for 0.4 mile and pull into a large gravel parking area on the left for Pittsfield State Forest. The parking area is typically marked as "ATV Parking" but hikers are also welcome to park here.